I just happen to love spiders. Especially the Fen Raft Spider, which is a very endangered spider. 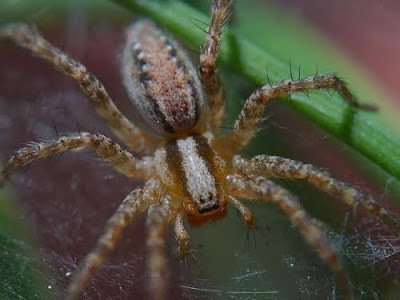 These spiders live in Britain (have any EcoBuddies fans in Britain seen these spiders? Let me know!) and live on the water. You know those spiders that zoom past you when you are swimming in a river? These spiders are like that. I think these spiders are awesome because the mom fen raft spiders carry their egg sacs underneath them for a few weeks when they are about to have babies. They are quite big egg sacs and I think they must be very strong to carry them for so long. Every so often they dip the eggs sacs in the water to keep them moist. Cool hey? Here is a trivia question for you: How long does it take for a fen raft spider to become an adult?